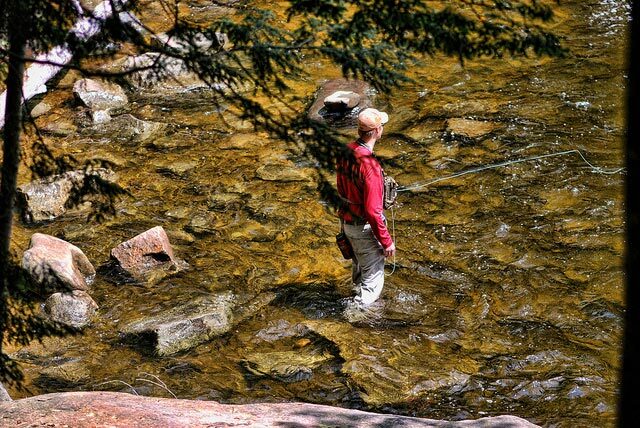 A recent fly fishing trip to the Catskills region high-lighted the importance of moving on. On day one of the trip, I saw what is an increasingly common sight: anglers lining up to fish a particularly productive fishing hole, or pool. One that is known for accommodating a good portion of large browns. Perhaps even a trophy brown. Each angler had their allotted time to formulate a strategy and make a number of casts. They then had to move out and let the next angler get their shot at this notable fishing spot. It’s easy to understand why any angler would want their turn at fishing these hot-spots. What’s not to like about successfully guiding a 25-inch trout to your net? On day two, during a brief wade through a shallow stretch, I spotted five or perhaps six anglers lined-up at one of the holes. I found this activity, or more precisely, inactivity, to be unappealing. Anglers want and ought not be deprived their trophy fish, but I’ll argue that there’s a balance to be struck, and that there’s an uneven balance when line-ups at pools bring to mind standing in line with your kid in order to get onto a ride at Disney. Notable pools and holes are just that because of the generously sized fish they harbor, but even the most legendary of fishing holes can suffer from over-fishing. Some even undergo temporary exhaustion, leaving anglers wondering what might be wrong. Despite the overfishing, fish will usually return to these holes because of the extraordinary underwater topography that offers both protection and a steady supply of nourishment. I can’t help feeling that landing that trophy trout – or even just a hefty trout – in an unexpected location will make that fish all the more memorable. The expression “shooting fish in a barrel” comes to mind, and there’s no fun – or satisfaction – in that. One of several golden rules in angling is to cover as much water as possible, so the next time you see one of these line-ups, move on. Time on the water is best spent fishing, not waiting for your turn.